If your order weighs less than 13 ounces, save huge on shipping with USPS first class (with tracking number). This product weighs 2.4 oz. Nature’s Sunshine IF Relief contains a combination of herbal extracts that may support the body’s natural process for muscle pain and inflammation relief following exercise and massage. IF Relief contains compounds that may help the body achieve homeostasis. This formula has a very high ORAC value. 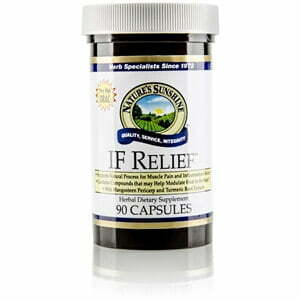 IF Relief contains turmeric root extract along with mangosteen pericarp extract–a source of potent antioxidants called xanthones. The xanthone gammamangostin appears to partially modulate the production of prostaglandins. IF Relief also contains Andrographis paniculata to help modulate certain undesirable responses; boswellia gum extract, which appears to modulate an enzyme that catalyzes leukotriene formation; and white willow bark extract, which contains salicin and appears to modulate the production of prostaglandins. Instructions: Take one capsule three times daily with a meal. Cellulose (plant fiber), magnesium stearate (vegetable), silicon dioxide (powdered silica), gelatin, and water.